-You can tune into 90.3FM on yer radio dial. -Or stream by clicking the Listen Live button top right of the screen. -Does your phone have a radio? Try that. Or listen on your smart phone by downloading the free app TuneIn Radio. -Missed your favourite show? We gotcha covered. CKUT archives go back three months. -iTunes? You can click the Subscribe in iTunes link on any show page to get a subscription. -Do you use other music players or podcast apps? 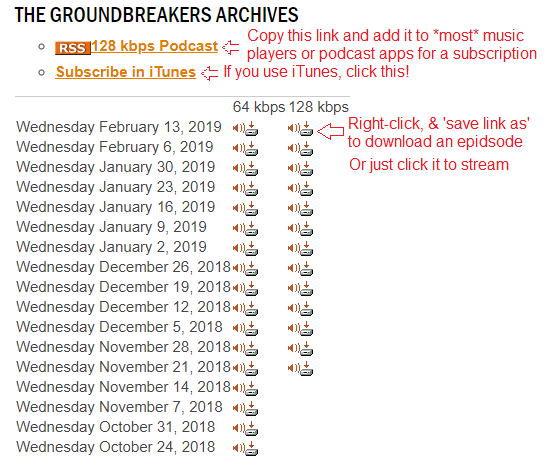 Copy the RSS 128kpbs Podcast link on any show page into your player/app to get a subscription. There is also a directory of RSS feeds at the bottom of this page. -Want to browse highlights? Hit up our Soundcloud & Youtube channel. -Don’t know what to listen to? Browse this page!